If you have been looking forward to giving your child some off-roading experience, then turning to the Razor Dune Buggy is your best bet. It is designed to offer the perfect adventurous experience to your kid while its reduction drive keeps the torque low enough for climbing and off-roading. In the field of electric-powered backcountry cruising, it is the most perfect option that could opt for. What makes it stand out from other buggy carts is the fact that it is fast enough for your kids to have fun but also slow enough to give you peace of mind while your kid cruises along. Parents will not need to worry about their kid falling off on the ground because of the side roll cage that prevents the rider from meeting an accident. The additional safety features include padded back seat and a seatbelt. Your child’s security is not compromised in any way. The vehicle does not need gas to run because it is fully electric and does not produce emissions. With proper brake controls, hand throttle, safety flag and a rear disc brake, the buggy can easily ride through tough and uneven terrains with kids that are 8 years or older. This dune buggy for kids has a number of other incredible features that have been studied at length in the review below. This dune buggy is run by two 12V lead acid rechargeable batteries. The charger is included along with the purchase. While the initial charging time will be a maximum of 18 hours, you can fully charge the batteries in 12 hours from the next time. When you are not using the charger, you can charge the batteries once a month to keep it in optimal condition. The best part about the battery is how it can last for 250 charge cycles. If your kid has had an experience of riding dune buggies earlier, he or she will have no issues riding it at an earlier age. 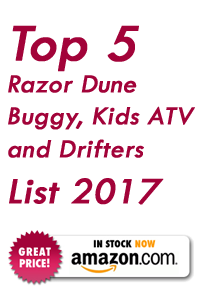 Although the official website recommends a minimum age of 8 years, a 5 or 6 year old can ride it without any trouble. The maximum speed of the dune buggy is completely adjustable and you can do it with the simple use of an allen wrench. You can easily customize the throttle so that your child cannot go over safe speed limits even if he or she is tempted to. The 65-pound steel frame is sturdy enough to keep the buggy upright even at the tightest turns. This prevents your child from falling off while taking turns in the buggy. The steering wheel features easy-to-use rear disc brakes that will allow the kid to halt the buggy in case there is an obstruction ahead. What matters to us the most is our child’s safety whenever he or she is involved in active play. With the Razor dune buggy, you will not need to worry about it since the safety flag will always let you know whether he or she is doing fine. The buggy has the added advantage of being a fully electric vehicle which means no fear of gas leakage or combustibles when the motor is being fired up. All kids love fast and adventure-filled rides and yours would want the same. With a high-torque 350W electric motor that is driven by a convenient throttle, the Razor dune buggy can go up to a speed of 10 mp. This is fast enough for them to race each other around and explore their abilities a little more by increasing and controlling speeds as and when required. This dune buggy has 8 inch knobby pneumatic tires that are built to endure the roughest of terrains while providing a comfortable ride to your kids. While being made of a tubular steel frame, this vehicle is light in weight and compact enough to be stored vertically. This saves space, especially if your house is already cramped with a number of other things. Owing to the fact that this buggy features a hand-controlled accelerator and has a rear disk braking system that is also hand operated, riding and controlling the dune buggy is easy as it gets. What we do not like about the buggy? Since the ground clearance is just about two inches, you will need to make sure that there are no obstacles or rocks on the driving path, especially if your kid is not as old or experienced. Since the light that indicates low battery does not specify how much battery might be left, your kid could get stuck at unfavorable positions and you will need to drag him or her along with the buggy back home. The customer service is not that good and you might have to follow-up on your complains and requests, if any. 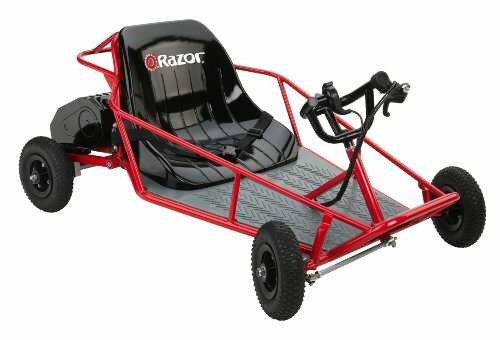 What makes the Razor Buggy stand out? This Razor dune buggy for kids arrives all ready to use. We usually panic whenever a new toy or gadget comes in because assembly is often a huge hassle. This buggy comes pre-assembled and is almost always recharged. This means that unlike other buggies that need time to get charged and assembled, this one is good to go from the time of arrival. Traditional dune buggies will need the kids to practice a number of times before they get hold of the foot pedal. This one at hand has a thumb control for acceleration that allows smaller and less experienced kids to have fun without needing to learn anything. Not many dune buggies would give you the opportunity to control your kid’s speed levels. The Razor dune buggy allows you to modify the speed levels manually so that at any point in time, your child cannot go over the safe speed limits for the dune buggy. Most dune buggies with the same kind of capacity would run the risk of toppling over or your child falling off sideways. This dune buggy does not disappoint at all. If you choose to let your kid play around in the backyard, you will not have to worry about wood chips, weedy and uneven areas because it tends to slow down in such places. There is also a side roll cage keeps a safe distance of the rider from the ground. While a go kart would usually not be able to handle an inch or two of bumps, this vehicle has softer tires that can handle the uneven terrains. Whether you are riding over grass, asphalt or cement, the vehicle provides maximum comfort. You will not really need to look for a dune buggy for sale because the Razor dune buggy is competitively priced and is totally worth an investment. This buggy is suited for you if you have always wanted your child to have an outdoorsy experience without over-speeding or going out of control. With the safety flag in place, you will always be aware of where your child is heading. Needless to say, this vehicle will provide hours of fun and will keep your child as engaged as you want him or her to be. 2 What we do not like about the buggy? 3 What makes the Razor Buggy stand out?